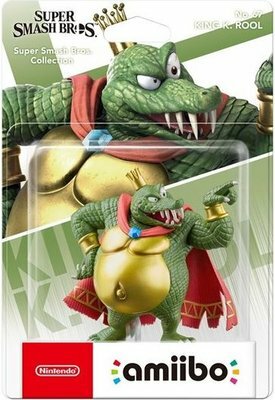 King K. Rool (known as K. Rool) who has gone by many aliases, is the malevolent king of the Kremlings and the main antagonist in the Donkey Kong franchise, as well as the archenemy of Donkey Kong, Diddy Kong and their allies. King K. Rool has repeatedly tried to steal the Kongs' Banana Hoard for unknown reasons, though it has been suggested that he takes the hoard in order to starve the Kongs, in addition to personally liking bananas. He has even kidnapped members of the Kong Family on various occasions. His name is a pun on the word "cruel", which often describes his actions and his personality, as well as a corruption of "rule" as he is the ruler of the Kremlings. amiibo are interactive figures and cards that work with your games. Tap an amiibo while playing compatible Nintendo Switch, Nintendo 3DS or Wii U software and you’ll uncover surprising new features! amiibo have different effects depending on the game: you might unlock new modes, weapons or character customisations, or even boost your amiibo’s abilities to turn it into your perfect partner – or a formidable foe!